Our mission is to empower investors through education. This mission is our passion and what drives us to go to work everyday. But this mission is not our product. 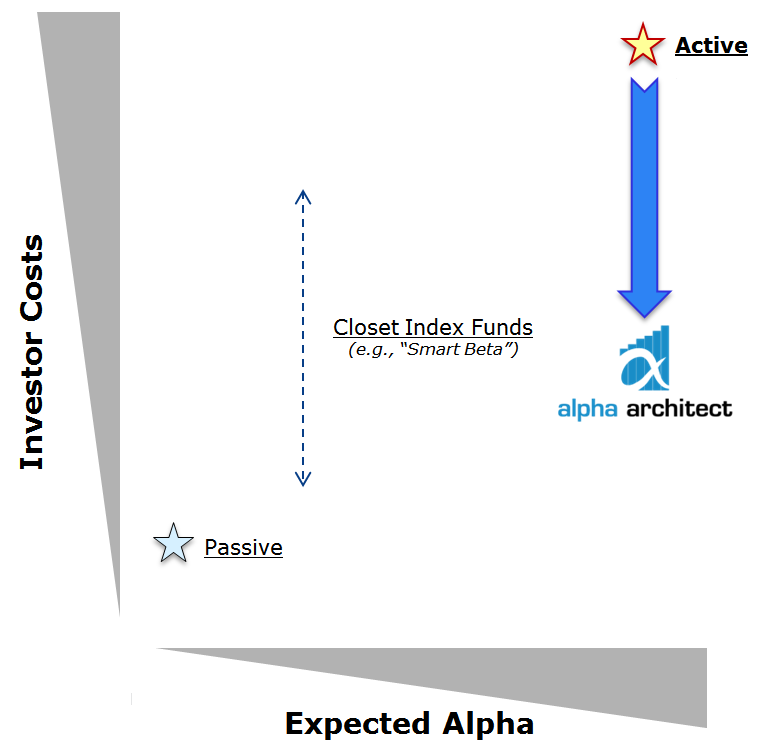 Our product is Affordable Alpha: We seek to delivers alpha (highly differentiated risk/reward profiles) at low costs, thereby giving sophisticated (taxable) investors a higher chance of winning net of fees and taxes. Serving in the Marine Corps was an unforgettable experience. Civilians often tell us “thank you for your service”; however, the real “thanks” is due to the Corps for giving us valuable life lessons. The not-so subtle teachings bestowed upon us by heavily muscled, insanely aggressive Marine Corps Drill Sergeants are still, literally, ringing in our ears: “Listen here, pond scum, you better run faster, shoot straighter, and decide quicker if you are going to win in battle!” Years later, we would test that theory in real-time, battling insurgents in Iraq. As we trade in our flak jackets for laptops and neckties, the lessons learned in combat and are not only relevant, but vital on the battlefield of high finance. Four core lessons apply to frontlines and finance: Humans Are Emotional: Systematic processes beat behavioral bias; Rambo isn't Realistic: Act based on evidence, not on stories; Complacency Kills: Focus on fundamentals and never stop learning; Integrity is Everything: Do things right and do the right thing. The evidence suggests that we keep highly active exposures to value and momentum in their purest forms (assuming we are doing high-conviction non-watered down versions of the anomalies). Blending the strategy dilutes the benefit of value and momentum portfolios. The summary of the benefits of a pure value and a pure momentum approach can be summarized as follows: Easier ex-post assessment, stronger portfolio diversification benefits, and stronger expected performance. Robust asset allocation solutions should be relatively simple, minimize complexity, and be robust across different market regimes. Simultaneous to these requirements, the solution must be affordable, liquid, simple, tax-efficient, and transparent, otherwise, many of the benefits of the solution will flow to the croupiers and Uncle Sam. We recommend that investors explore our robust asset allocation framework and go for the do-it-yourself solution. You'll be paying yourself 1%+ a year via saved RIA fees. Is this the only solution? No. But any solution must be robust, simple, tax-manageable, and low-cost. This is our best effort to develop a simple model. Developing a complicated model is easy; simple is difficult. Benjamin Graham, who first established the idea of purchasing stocks at a discount to their intrinsic value more than 80 years ago, is known today as the father of value investing. Since Graham’s time, academic research has shown that low price to fundamentals stocks have historically outperformed the market. In the investing world, Graham’s most famous student, Warren Buffett, has inspired legions of investors to adopt the value philosophy. Despite the widespread knowledge that value investing generates higher returns over the long-haul, value-based strategies continue to outperform the market. How is this possible? The answer relates to a fundamental truth: human beings behave irrationally. We are influenced by an evolutionary history that preserved traits fitted for keeping us alive in the jungle, not for optimizing our portfolio decision-making ability. While we will never eliminate our subconscious biases, we can minimize their effects by employing quantitative tools. Value Investing: Never Buy Expensive Stocks. Period. Momentum Investing: Ride Winners and Cut Losers. Period. Momentum has historically been a great strategy. Although counter-intuitive to many value investors, buying stocks with rising prices has been a great investment approach--arguably better than value investing. Moreover, the approach is robust between the 2 samples analyzed. The lesson is clear: Let your winners ride and cut your losers short.